Our intention is to have every Volvo-link worth knowing about on this page! If we have missed one - please contact us! "C" after a link means that we have found the site commercial in some way. There are also some non-Volvo links that our webmaster finds interesting and/or amusing. Enjoy! If you are trying to find a Volvo club some where in the world, please take a look at our page with all Volvo clubs that we know about. With addresses and phone numbers! 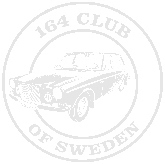 www.164club.se/club.html. Found a bad link? Please contact us! TjorvenWeb - Renovering av en Kalmar KVD 441B. Turbobricks - Turbocharged Volvo Performance! Brad's '70 914 2.0L look a bit down on the page for some EXCELLENT D-jet pages!!!! BrickBoardTM.com is centered around several forums for Volvo enthusiasts. The two main forums: RWD (rear wheel drive) and AWD/FWD (all/front wheel drive) are filled with technical questions and answers. These forums are the most active conversations. SwedishBricks is an online forum created over six years ago for technical discussions of issues related to Volvos, primarily for 200 series owners. It was originally hosted on a university computer, and then, in mid-1996, moved to a commercial ISP running majordomo. In August of 1997, the group established its own web site - this one- and once again moved mailing list services, this time to a commercial mailing list product. This group talks mostly about driving, maintenance and repair issues concerning Volvo's sold in North America over the last 20 years. Most of the talk comes from owners of 200 and 700/900 series cars. There is a nucleus of 544, 122, 1800 and 140/160 owners and a few 850 owners. Subject matter on this list tends to be relatively technical, with most of the discussion concerning repair issues of higher mileage vehicles. The list has been quite talkative, with as many as 40 messages per day being not uncommon. Turbobricks - For all Volvo TURBO enthusiasts.